Oh boy, another position for Pete Carroll to consider. Not that there's anything funny about a guy losing his job, but what amused us about the sacking of Art Shell on Thursday was that Al Davis is going to make him stick around and do office work during the final year of his contract next season, when Shell is due to earn $2 million. 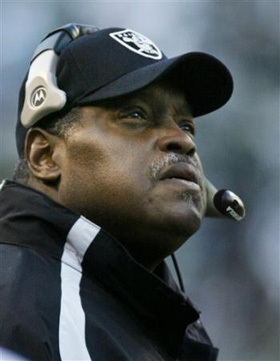 "While Art will no longer serve as head coach, he and Mr. Davis have discussed and will continue to discuss opportunities for Art to remain a valued member of the Raider organization," read a Raiders press release. In other words, um Art, could you sweep up any broken glass or other loose debris you see around the Raiders organization? We also have to wonder if Davis and Shell have a budding Billy Martin/George Steinbrenner thing going here. The first time Davis hired him was in 1989, replacing Mike Shanahan. Shell was canned in '94 after taking the Raiders to a 9-7 record ... which must be looking pretty good in retrospect. Oakland was 2-14 this season. Top replacement candidates? Hard to say: They won't stop running long enough to be clearly recognized. OK, the San Francisco Chronicle is naming Raiders defensive coordinator Rob Ryan, former Giants coach and Raiders assistant Jim Fassel, Louisville coach Bobby Petrino, Bears defensive coordinator Ron Rivera and Fresno State coach Pat Hill. So Art Shell, finally gone. It's like he just got here; we never had time to say goodbye.